Purple vs. White vs. Green Asparagus: What's the Difference? A harbinger of spring, asparagus of any color makes for a flavorful vegetable dish that can be served on its own, tossed into pasta or baked into a quiche. The vegetable comes in green, white, and purple hues. Americans are more aware of green asparagus than of its white-hued sibling, which is much more popular in Europe. Purple asparagus was developed in Italy and is just as uncommon in America as white spears are. Purple and white asparagus might be seasonally sold at farmers markets or in specialty stores, but often white asparagus is only seen in the U.S. as a canned product. All three types of asparagus are available in spring, but their differences go far beyond just the color of the stalks. White and green asparagus differences include the texture, the flavor, the proper preparation, and perhaps the biggest difference of all, the growing method. Purple asparagus comes from certain varieties of asparagus, but the difference between white vs. green asparagus is in its growing method. Simply put, white asparagus is grown underground. Farmers piled a thick mound of dirt over the white asparagus or cover it with black plastic to ensure that not a single ray of sunlight hits the spears, a process known as etiolation. Therefore, the white asparagus is not exposed to sunlight and doesn't produce chlorophyll. The verdant asparagus pokes through the dirt as it grows, soaking up the sun and producing chlorophyll, which is what turns the vegetable green. Green asparagus is a bit grassy in flavor, while white asparagus is mild and slightly bitter. Purple asparagus is a bit nuttier and sweeter because it has about 20 percent more sugar in its stalks. While the stalks are purple on the outside, the interior of the asparagus is the same as a green spear. Green is considered to be the most nutritious when comparing purple vs. white vs. green asparagus, as it contains potassium, calcium, vitamins B and C, folic acid, and beta-carotene. It also has the most fiber of the colors. Purple asparagus contains anthocyanins, which are antioxidants. Both white and purple asparagus can be prepared and served in the same ways that green asparagus is—roasted, baked, sauteed, shaved in salads and more. However, the spears of white asparagus are thicker and a little bit more fibrous than green asparagus, so the bottom two-thirds should be peeled. Make sure that the white spears are cooked all the way through before serving, but those thicker stalks lend themselves to roasting and grilling. In Europe, white asparagus is typically simmered and then either drizzled with melted butter or dipped in hollandaise sauce. 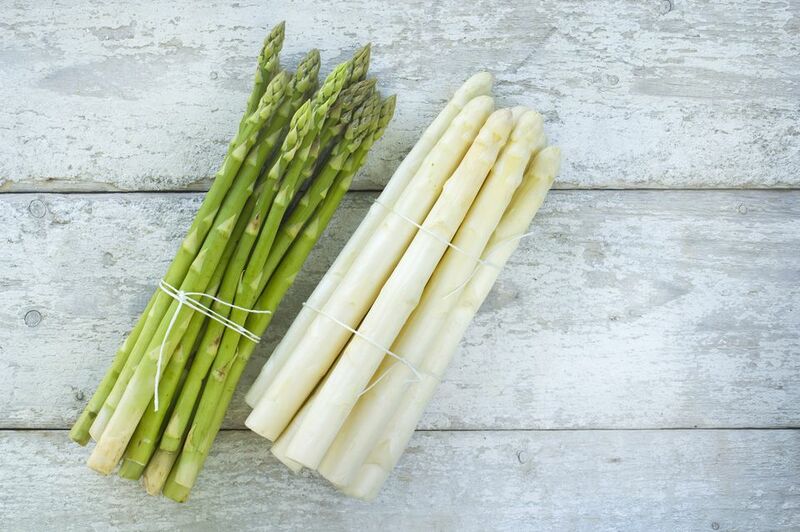 If you're feeling colorful and want to serve white and green asparagus in one dish, cook them separately unless the stalks all look to be the same relative thickness. While it would be great to have all three colors of asparagus in a dish, the purple variety turns green when cooked. If you want to see all three, shave the stalks and serve it raw in a salad.